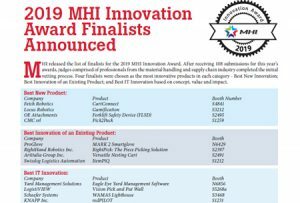 MHI released the list of finalists for the 2019 MHI Innovation Award. After receiving 108 submissions for this year’s awards, judges comprised of professionals from the material handling and supply chain industry completed the initial vetting process. Four finalists were chosen as the most innovative products in each category – Best New Innovation; Best Innovation of an Existing Product; and Best IT Innovation based on concept, value and impact.